Custom ground cloth for the Mountain Hardwear Trango 3 tent. The waterproof footprint protects the tent floor from damage and prolongs the life of the tent. �Custom ground cloths, called tent footprints, are available for most Mountain Hardwear tents. �The Trango� 3 Footprint is a waterproof footprint that protects the tent floor from damage and prolongs tent life by adding a layer between the tent floor and the ground. 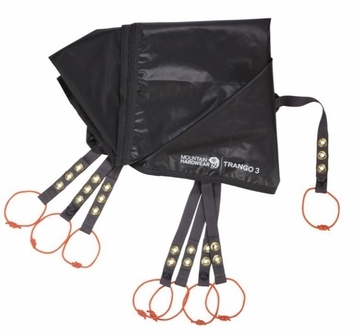 �Grommet tabs attach to tent pole ends.